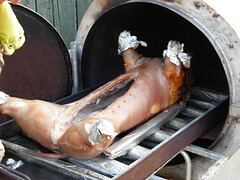 When I am cooking whole pigs on my charcoal rotisserie, I will slash the hams to get the rear hooves folded under the belly area, this decreases the thickness of the meat sinificanlty. I also place more fuel near the shoulders and hams to cook at higher temps there and be able to get those shoulders and hams done without having dried out backloins. When I do them in my enclosed cooker, I still slash the hams and cut deeply into the shoulders for the same reason, You may be able to use a stainless steel skewer insterted into the joint area to get some heat radiating deeper in there too. Great thread with lots of info. I need more about 1/2 a pig split up the middle. Going to be my first large meat smoke in my rf. www.photobucket.com/vermontbbquer. Wondering how to place it on the grate skin or meat up? What type marinating style dry rub,injection or wet rub? How long to set marinating? Should I spritz with any thing? I have a stack of cherry and maple. Use one or combine them? 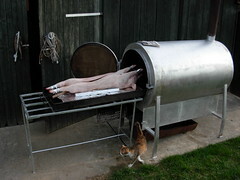 Going to get slaughtered this fri and starting the cook sat night sun morning depending on the actual weight of it. Serving friends. Thanks for helping. Home made RF built from a 500 gal propane tank(cookin chamber) and a 250lb tank (fire box). 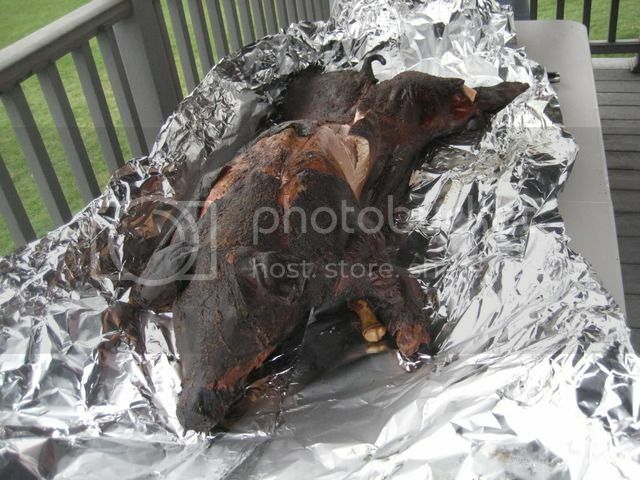 If the hog is to be used as a well decorated centerpiece before carving, I do them skin up, cover the ears and snout with foil so they do not burn. 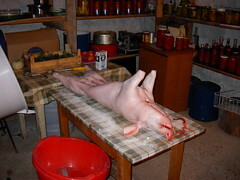 If the hog is not going to be a centerpiece, I do skin down, and mop the inside with a vinegar-based mopping liquid. I prefer the flavor of the meat when I have the skin down becuase I can baste and mop and my seasoning stay in contact with the meat. Not going to be a center piece. How often would you open the pit to baste it? Will I get good smoke flavor with it being in half with the skin down? Where might I find some recipies for the viniger based mop? Could it also be injected? Would injecting also require multiple applications as well ? Just a simple cider vinegar is fine, or you could mix in a little Franks red-Hot into that too. Maybe even a 50/50 mix of Worcestershire and vinegar. or look up a simple vinegar sauce recipe, and make that at least 1 week before the cook to get the flavors to meld. I mop whenever a add wood to the firebox, Just remember every time you open that lid, you may be adding as much as 15 minutes on to your cook each and every time. I do not inject, I prefer the pork to taste like pork instead of whatever is injected into it. Some people will inject and do all sorts of other time consuming things to their meats, I prefer to simply let the smoke and my seasoning work their magic. Some people have never even tried simple BBQ'd meats because they see competitors injecting and think they should do it too. I suggest you keep it simple your first time, and if you find a need to add more flavor or change the flavor try doing that the 2nd time you cook to see which you like better. Or inject the hams, and leave the shoulders to see which you prefer to have in the future. Sorry, no after photos of this one. Dad over-stoked the fire and the little guy actually caught fire. I was snapping pics, but wisely left the area when the flames started shooting out the door. Funny thin is, this one tasted great just like the earlier ones in a pit. Smoke rules! I haven't been on this site much, but I figured it'd be the best place to get a few questions answered that I have. I apologize for the lengthy post. 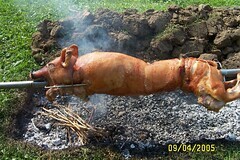 First of all, just looking at all the pictures in this thread, does everyone cook their pigs "right side up." I've always laid mine in on it's back. I am however smoking it over indirect heat though, so does that make a difference? The question I came here to ask is about catering though. 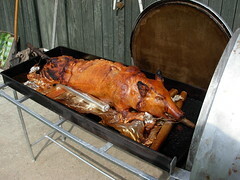 A few years ago I did a whole pig for a friends wedding, and it was very well received. The owner of the place the wedding was at contacted me and said that there were people calling her, wanting me to cook for their weddings. I couldn't do it though since I was still in college. I'm doing another pig for a friends wedding next month, and have already gotten calls from her friends about doing pigs for other weddings. My question is: What do I need to do in order to be "legal?" I want to cook pigs for these other peoples weddings and get paid, so how do I go about doing this? I have no idea where to start with this or where to look information, so any info would be greatly appreciated. So I searched around this site and I did find a bunch of information, but everything seemed like it was for someone who wanted to start a full time business. I just want to do a few weddings and partys a year on weekends when I've got nothing else to do. Just thought I should add that in there. http://www.thesmokering.com/forum/viewtopic.php?t=4127 I know it says full time, but it's the same for part time if you are doing it legally. Hows this one look fellas? My first one... only 21 lbs. Cooking it on the DP Big 40. From the looks of things on this smoker i`d bet i could only get a 70 lber max on there & might have to cut the head off at that. DP Big 40 measures 48 wide by 30 deep. Looks like i need a bigger cooker. Ready to pull for a little rest then we dig in. 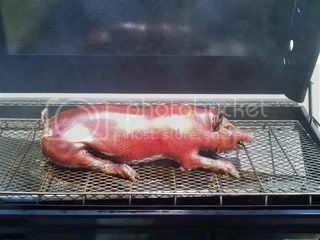 that uis some fine looking swine!! If you wrap those ears in foil, they stay a little less burned looking, and they make a great treat for the pooch that is hanging around. Thanks for the info, it just seems like wayy too much work for something that I'd only be doing less than 10 times per year. Thanks Harry it sure was moist and real tender. Had it on for 7-8 hours at 250 or so, pulled it off at 185 every one was hungry. Thought we`ll have to just slice what i could. But i`ll be damned if it pulled easy from the bone after a 20-30 minute rest. Thermopen was spot on as far as accuracy. Checked it before hand. Next time i think i`ll run a little hotter & cut some of the cook time down. As moist & tender as it was i think one could get away with it. Foiling the ears... i thought of that after i was done. 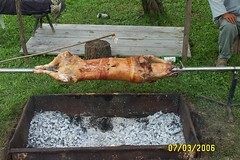 It was fun and rather easy cooking the little piggy on the DP big 40. Cant wait till next time to do another. Some thing new for me. Harry said"Some people will inject and do all sorts of other time consuming things to their meats, I prefer to simply let the smoke and my seasoning work their magic." Ok - my wife has been trying to get me to do a whole hog but I have been gun shy about it. I have been pretty successful (per friends & family) with butts and whatnot, just not sure. My biggest concern is if I will have enough room. I have a Silver Smoker (sold by HomeDepot) and a Brinkmann cabinet smoker. The Brinkmann has just shelves so that will not work. But will the SilverSmoker be big enough? I don't want to end up with not enough room, if you know what I mean. Thanks for the help. 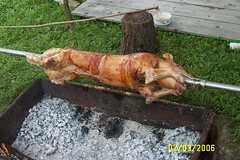 Unfortunately I do not have pictures of the pig roast I did (Forgot the camera). It was the first on my smoker with a friend who has done many. 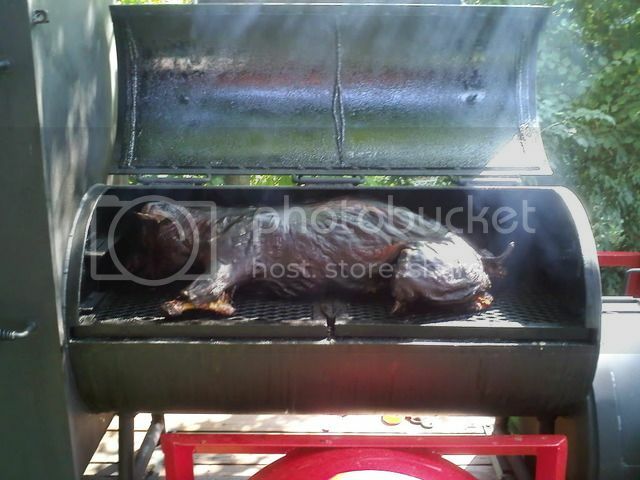 The thing that we did was placed it upside down on the smoker and he cooked it at 300-350F. 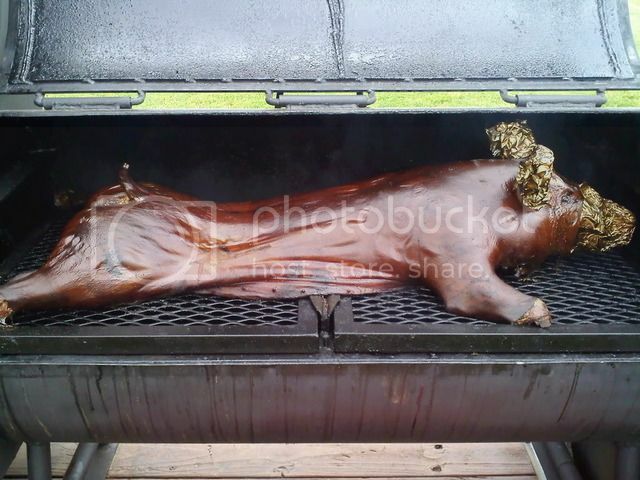 I was so afraid that it would be dry like so many other times I have tried whole hogs. BUT it was not. 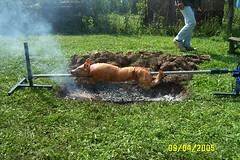 The pig was about 160 lbs and it took about 12 hours to cook. It was very moist, to my surprise.